On Tuesday, Apple Inc. has reported its first ever improvement in iPhone sales after 3 quarters of decline. 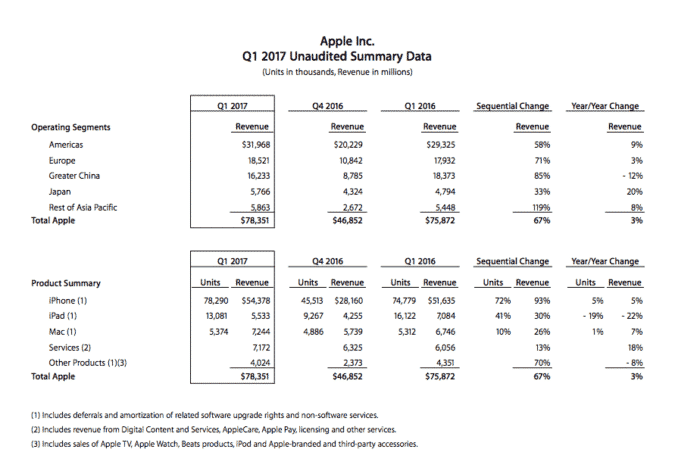 Apple has reported a revenue of $78.4 billion and earning per share of $3.36 for their fiscal first quarter 2017. The numbers easily surpassed all of those that were expected by many analysts. It is certainly better than last year’s $3.28 per share and $75.9 billion revenue. The quarterly revenue increased about $2.5 billion from the last Q4 2016 and earning per share improved by $0.08. Just around this time last year, Apple reported a record quarter with the sales of the iPhone at an all time high. However, soon after that the next three straight quarters of lower sales and lower revenue which added to the company’s first yearly decline since 2001. In a conference call with investors, CEO of Apple, Tim Cook, said that there was a strong demand for the iPhone 7 Plus in the market and that it made a much higher share of sale than expected. The average selling price of the iPhone grew to $695 from a very low $619 in September. The Mac also returned to growth and had the best sales ever. The revenue is generated from all Apple products such as the iPhone, iPad, Mac, Services and various other services include AppleCare, ApplePay. Other products include Apple TV, Apple Watch, Beats and iPod. According to the above summary, here is the revenue per product of Q1 2017 and the number of units sold as compared to last year’s Q1. The earnings from other products mentioned above was down by 8% as compared to last year’s Q1 revenue. Revenue from China, Apple’s 2nd largest market, dropped by 12% which is a huge loss. This combined with the reduction in iPad sales decreased the company’s overall revenue. Iphone is just a symbol of wealth and thats why Rich people keep on paying for the same thing with minimal upgrades every year. Don’t worry. Some day you’ll be able to sell your Q Mobile and get an iPhone too. I disagree that it is for the rich and only showoff. I have been using samsung from day one. But recently i switched over to apple due to the reason that samsung sets start to lag and slow down upon multi tasking. Further, facetime is alot better than other video calling applications. I have been using iphone since almost six months and i didnt needed to factory reset or delete applications since day one. I agree with your views about Samsung. Their customized version of android is not very efficient and has lot of un-necessary features. If you want iPhone like performance in Android phones then go for Nexus or Pixel series. Clean and efficient OS. Thanks to Samsung Note 7 blunder.